It's just the opening day of the second Test against India and England are already looking worried about the pitch on offer with pace spearhead James Anderson saying the visitors will have to bowl and bat out of their skins to dig themselves out of trouble. "I am not sure whether it (pitch) will stay together as well as Rajkot. There are already signs of the pitch keeping low. There will be more variable bounce, we have seen a few spun, so we are in tough position. We need to have a good day with the ball and an extremely good outing with the bat," Anderson said on Thursday, after India had piled up 317 for four at stumps on Day 1, courtesy Virat Kohli's 151 not out and Cheteshwar Pujara's 119. "The pitch is quite abrasive. The outfield is lush, there are not many areas to get the ball to reverse," he said. Kohli and Pujara had put on a 226 runs for the third wicket to bring India out of the trouble after both openers were dismissed early. "I thought the wicket was tough to bowl on. The outfield was heavy and there wil be some sore legs tomorrow. The two guys (Kohli and Pujara) went about their business and showed they are world class players. 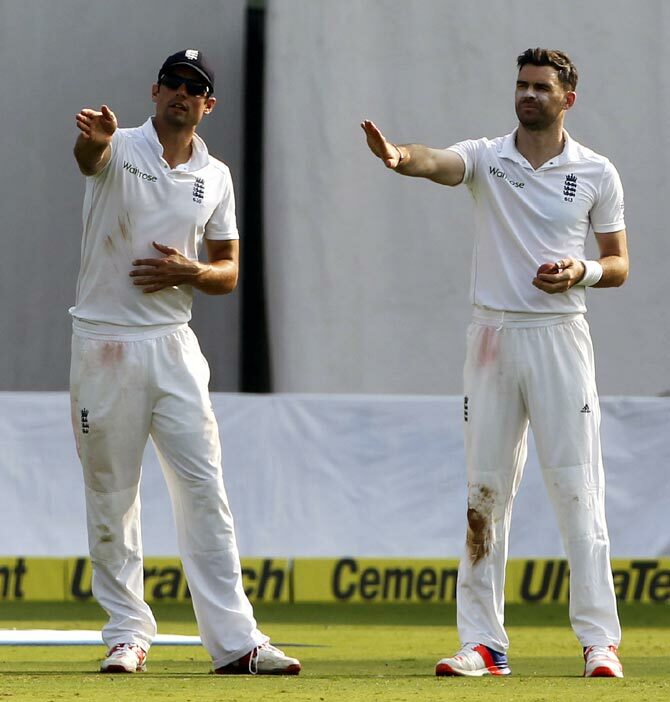 They made it very difficult to bowl at them," Anderson said. "We thought the way the new ball played in the morning it was the easiest time to bat as the ball didn't swing that much." Anderson, who claimed three for 44 in his comeback match, was the pick of the English bowlers and gave crucial breakthroughs in the form of Pujara and later dismissed Ajinkya Rahane with the second new ball. The English pacer hopes that they can utilise the early morning conditions on Day 2 and bundle out India early. "We didn't get much out of the pitch this morning and we went quickly to short balls against the openers. But it swung more in the evening. The conditions were different with the floodlights on and sun going down. Hopefully we can pick up more wickets in the morning with the new ball," Anderson said. The veteran pacer made a comeback to cricket after recovering from a shoulder injury that had kept him out since August. "It was great to be back. I have spent the last two months working really hard to get back into the side. It's been frustrating at times but it's been worth it. Getting back out there with the lads was a great feeling in itself but to get a few wickets on the board made it even better," he said. "I have missed it, I have missed playing and taking wickets. That sort of feeling you can't get in any other walk of life. To get some wickets meant a lot." Asked whether his shoulder has fully recovered, Anderson said in a lighter vein: "To be honest I haven't thought about the shoulder, it's the rest of my body that's in pieces right now. It's general recovery. Things I have been doing, I will keep doing them so it doesn't happen again."